Is The GB Pockit The Most Compact Stroller Ever Made? What’s Not To Love About Super Duper Compact Strollers? This includes crowded amusement parks and stores with narrow aisles. While many of the lightest stroller choices are not of the sturdiest construction, having a stroller that weighs only a few pounds or folds so small you could put it in carry-on luggage has got to be one of the coolest things ever for a parent. While there are many options available, a compact stroller is often the a last resort option for busy parents who are stuck shuttling older kids around as well as newborns and who never know when they’ll need to whip a stroller out of their magic bag, err– trunk. One huge downfall of almost all strollers is simply the amount of space they take up in your life. In addition to the space they consume when open, you also need to consider how much space will be required in the trunk of your car. But sometimes you find something that is just…small​… That is the best way to describe the GB Pockit. It’s the traditional umbrella stroller taken to a grand new level of fold-a-bility. It’s ideal for anyone who is struggling with storage space or cannot put a large stroller in the trunk of their particular car. Known as the top stroller for people navigating crowded city sidewalks as well as being popular with world travelers, the GB Pockit also admired by busy parents who have multiple kids and require space for a few different strollers in the car (or minivan as it may be). The GB features a clever two-step folding technique that allows you to easily and quickly breakdown the stroller and get it stored. You’ll spend less time struggling with this stroller, for example, at airport terminals or train stations and have more time to get the little one and yourself settled for the ride. With the ability to steer with one hand, you can keep an eye on your older kids while pushing the baby through the zoo (whether the Bronx or Brookfield or just the zoo of life). It only takes two steps to break the stroller from full-size down to a small rectangle, and it even has an ultra-compact folding option so that you can put the stroller in a large tote bag. All you have to do is flip the switch on the front wheels, press the handles, and the stroller will do the rest. Once it folds up, you can turn the wheels in towards each other and engage the locking mechanism. This tiny but powerful stroller is also built to last. The manufacturer chose durable materials that are strong but lightweight. The GB stroller is rated for children up to 55 pounds, yet it only weighs 9.5 pounds when empty. This allows you to easily pick it up and pack it away in the trunk of your car or even the overhead baggage compartment on an airplane. This alone makes it one of the top choices for frequent travelers. Also, if you’re worried about getting into and out of taxis while on vacation or you’re focused on buying a safe stroller than can get you quickly through the airport, this one is sure to please you. The Pockit folds down to an impressive 12 inches tall, 7 inches wide, and only 20 inches long, so it just doesn’t take up much space in any storage area. In fact, this stroller is so small that it’s actually recorded in the Guinness Book of World Records! So even if you’re living in a tiny Manhattan apartment, you can still tuck it away completely hidden in a front hall closet or some other nook you might not have been able to use before. One cool feature that is pretty neat and sets this stroller apart is that it actually stands on its own when folded. You don’t have to lean it against the table or wall at your favorite café or try to stick it into a corner where the coats are because the folded design is made to allow it to stand upright. This tiny powerhouse of a stroller also manages to include great features that you would expect to find in a much larger unit. This includes an adjustable five-point safety harness complete with shoulder and crotch pads. You can also adjust the height on the harness so that your child will still be comfortable even as she grows taller. This also allows your to child to stay comfortable even if she’s moving around a little more. The storage basket can carry up to 11 pounds, so you can feel free to remove the baby carrier or purse from your tired shoulders. 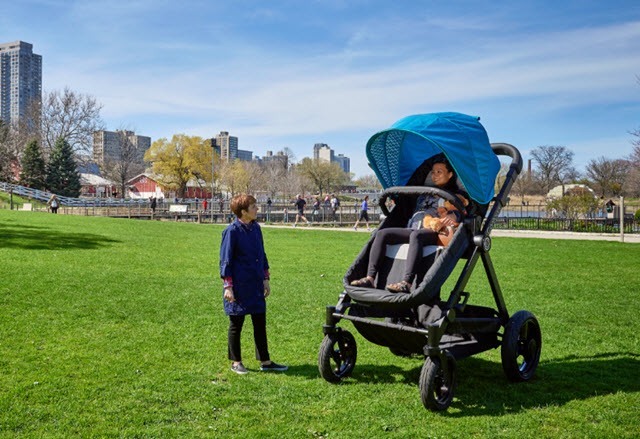 And with the canopy that lets out on top, this stroller is also appropriate for a walk in the park or running errands on a sunny day. You can also flip the canopy around behind the stroller if you don’t want to use it. As a parent, you’ll appreciate the ability to remove the fabric for easy cleaning. This makes it simple to clean up spilled drinks or snacks and keep the fabric looking great. Another great feature of this stroller is its narrow design. While it will comfortably seat your child, it’s also streamlined enough to maneuver through the busy and crowded downtown stores. Designed to be easy to steer, you can navigate with one hand while carrying bags or a mocha latte in your other hand. It’s also ideal for doctor’s appointments and any other time when you’re dealing with small areas. A simple, single-side foot brake allows you to lock both of the rear wheels. The front wheels also come with a locking option so that they can swivel or hold in a fixed position. You and your partner will also appreciate that adjustable handle bar that allows this stroller to easily adjust to the parent’s height. You can easily change the setting so that you and your spouse can take turns pushing the child around the block. Best of all the GB Pockit Stroller is available in several different colors, and you can add all types of accessories, including a warm, built-in blanket for traveling in cold weather.